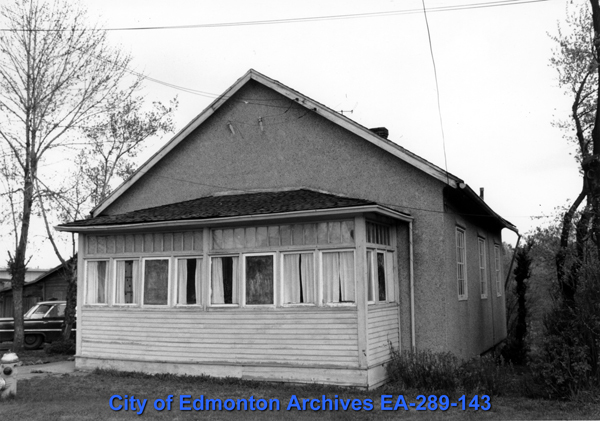 One of the earliest conservation projects undertaken by the Committee related to Charles "English Charlie" Stevenson, one of Edmonton's earliest and most colourful characters. 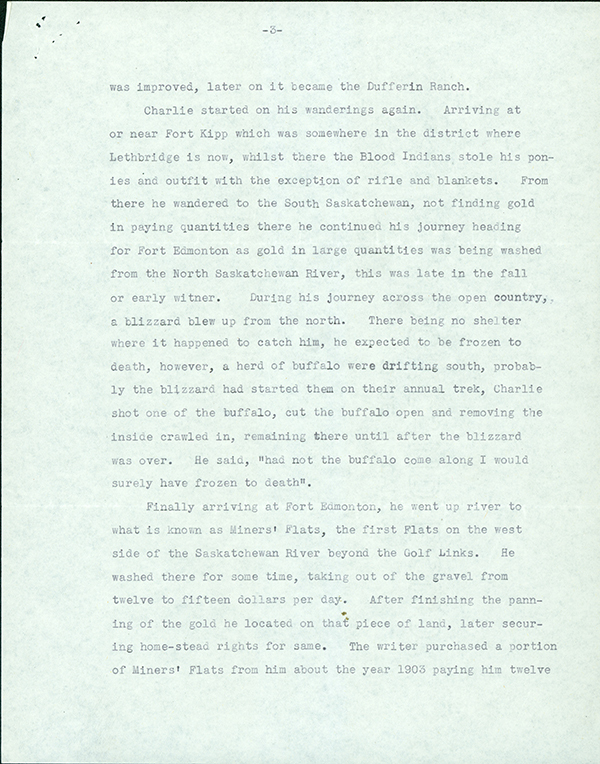 English Charlie was said to be a London news-boy who came to the new world as a stow-away and travelled the continent panning for gold. 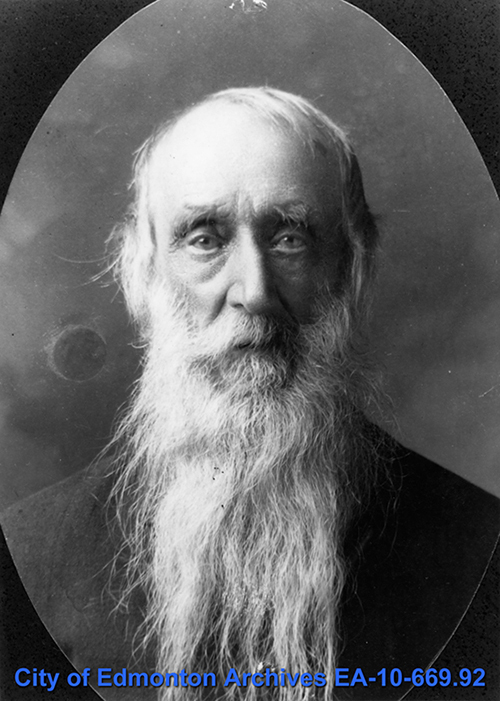 He arrived in Edmonton in the 1870s, where he built a cabin in what is today Laurier Park, known in those days as Miner's Flats. Stevenson secured homestead rights to the land around 1903, and soon after sold the land to realtor S. H. Smith for $12 an acre. 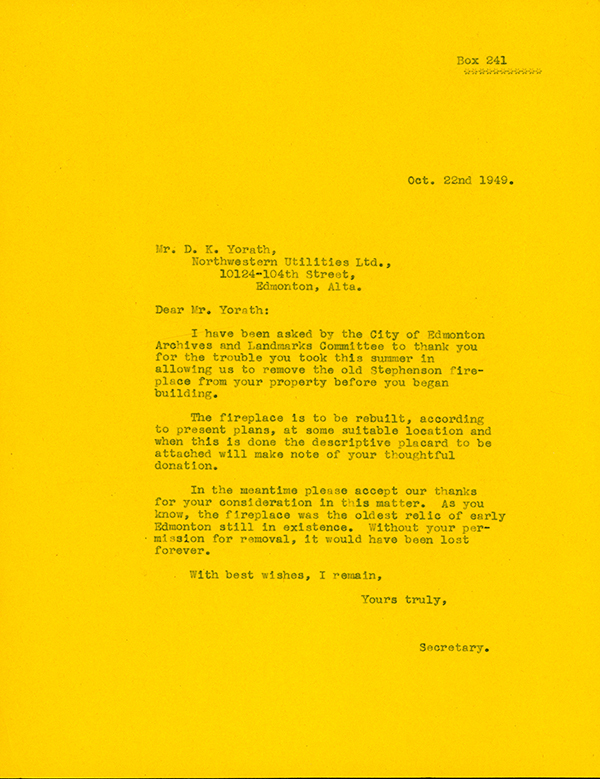 By 1948 another prominent Edmontonian had purchased the land: D.K. Yorath. 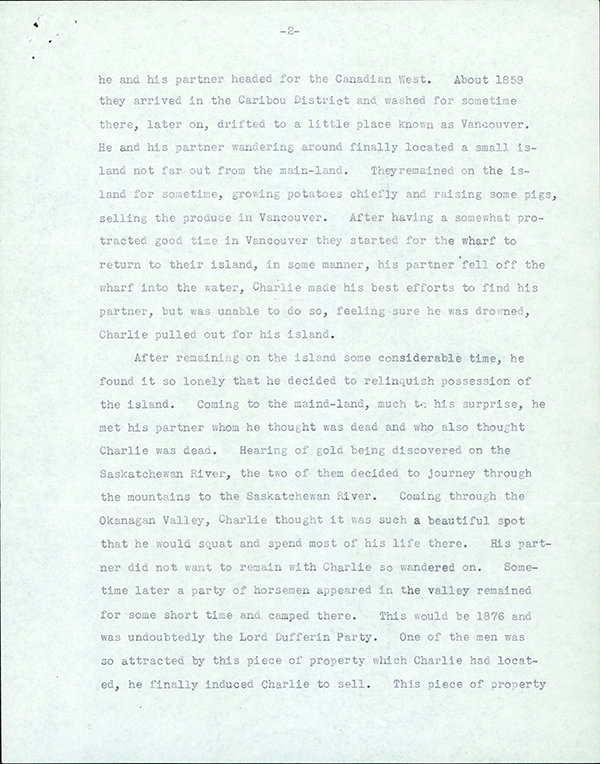 He was planning to build a house on the site and donated the chimney to the Archives and Landmarks Committee. 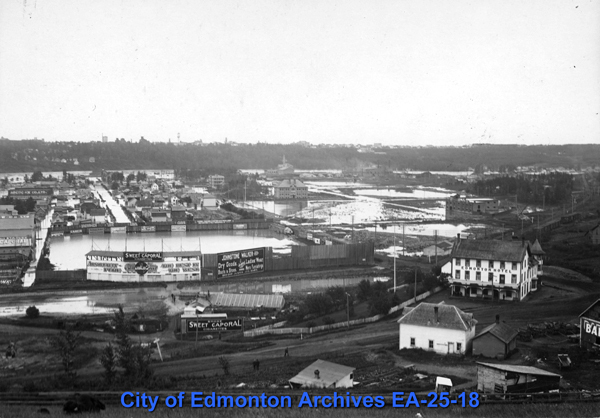 Plans were made to rebuild the structure either near the John Walter House or at a reconstruction of Fort Edmonton. 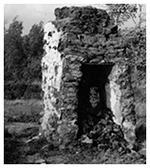 Despite the best intentions, the mud and straw mortar used in the chimney was too fragile for the move, and the plans for its re-erection were abandoned. 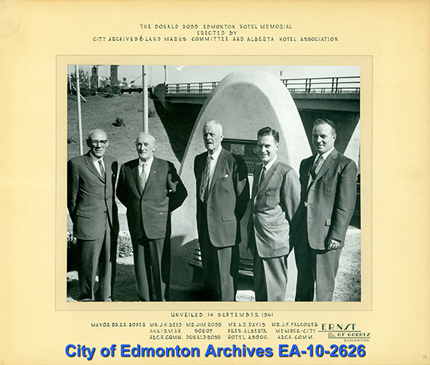 The Committee also made suggestions to Council on how to preserve historic sites, as was the case with the site of Donald Ross Edmonton Hotel. 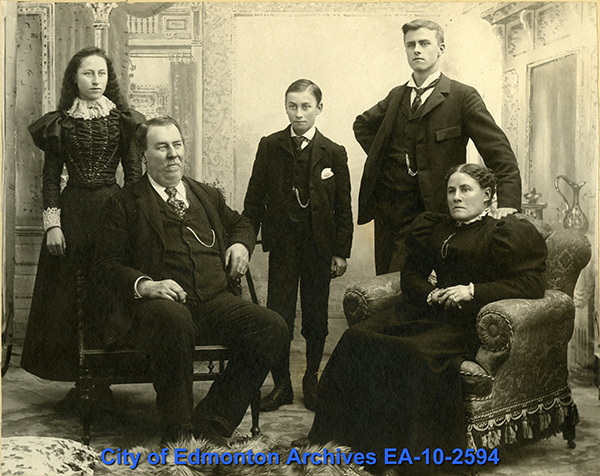 Donald Ross arrived in Edmonton in 1872 and purchased 70 acres of land around what is now Rossdale, where he built one of the community's first houses. 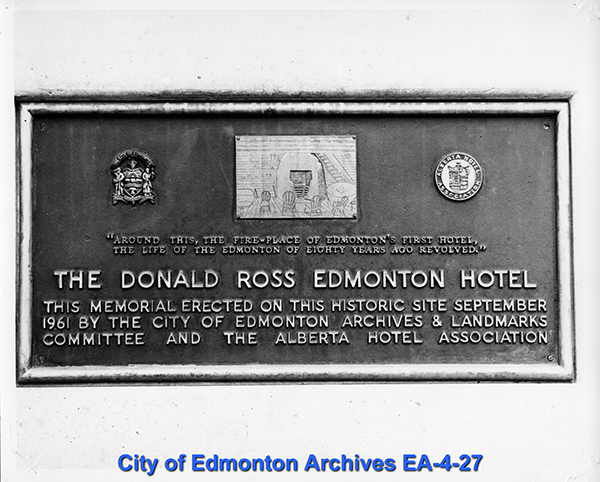 Ross rented the second floor of his house to newly arrived settlers, creating Edmonton's first hotel. As more people came to Edmonton, Ross needed more space and expanded the home three times. 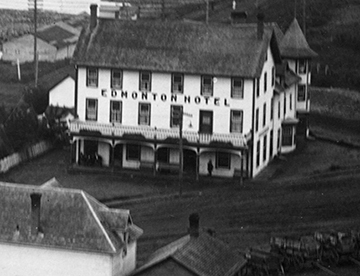 When he died in 1915 the Edmonton Hotel was turned into a rooming house, but burned down in 1925. 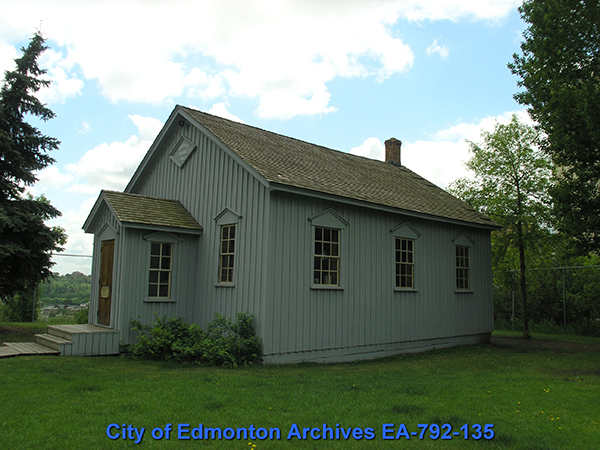 Ella May Walker identified the 1881 School House as an important historical building, and it appears on her map of Edmonton's Historic Landmarks. 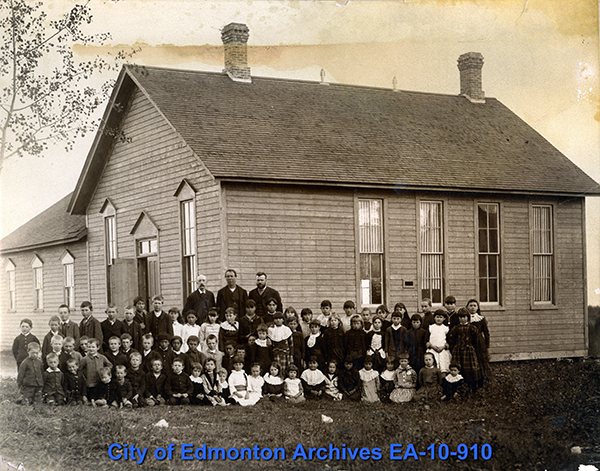 Built in 1881, the building was Edmonton's first public school. It was used until 1904, when MacKay Avenue School was built. Eventually the small school was sold and moved to Rossdale, where it became a private residence. Although some changes were made, Ella's interest kept the building on the Committee's radar. In 1979 it was purchased by the City of Edmonton and donated to the Edmonton Public School Board (EPSB). 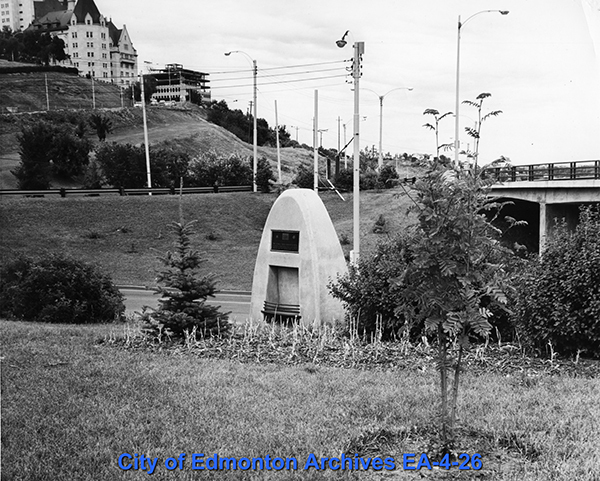 It was moved to its current location very near its original site and restored as part of the EPSB Centennial in 1982. 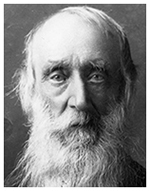 Charles “English Charlie” Stevenson in 1904. 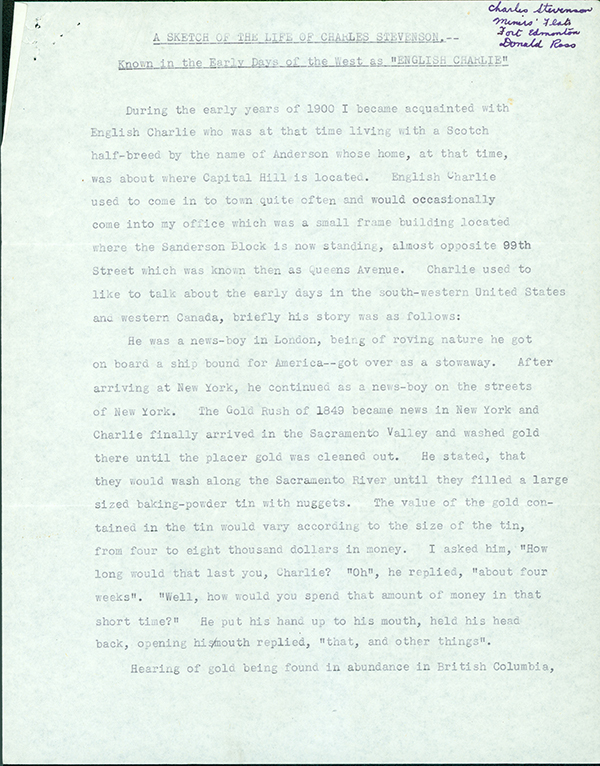 Excerpt from Major Matthews’ letter in Charles Stevenson clipping file. 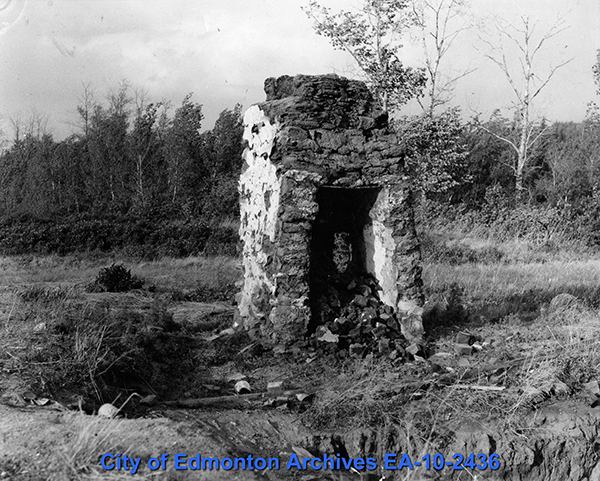 Stevenson's cabin which burned down around 1946. 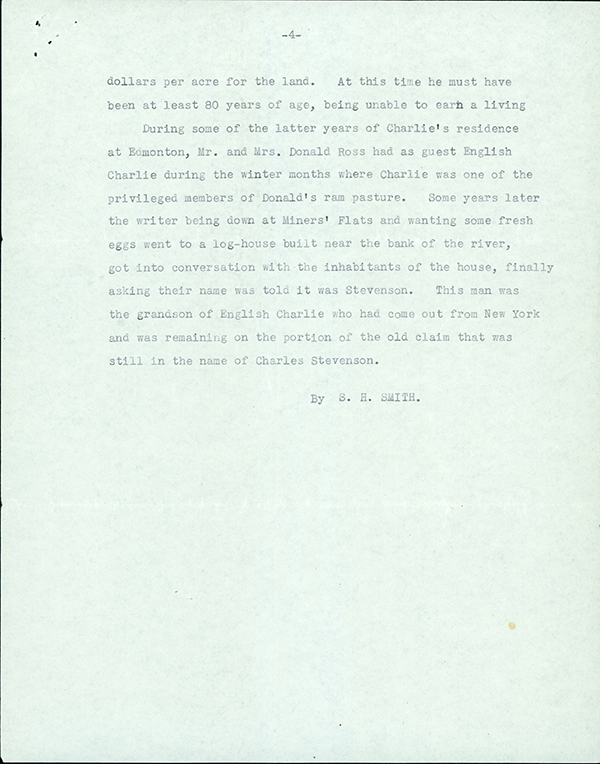 Letter of thanks to D.K. Yorath. 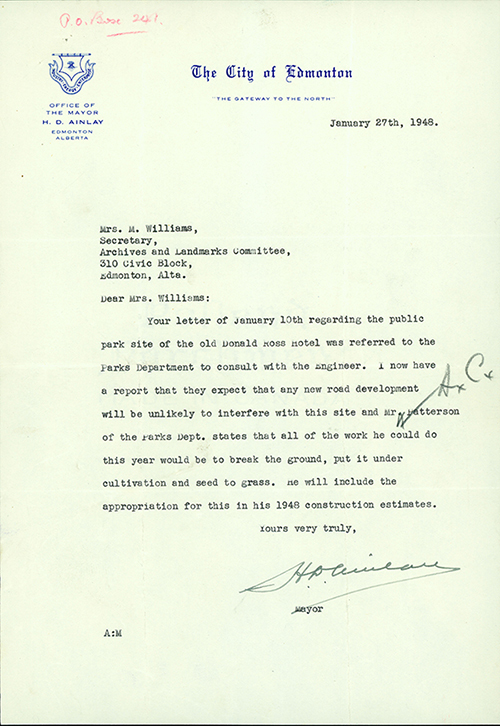 Letter to Council re: Donald Ross Hotel. 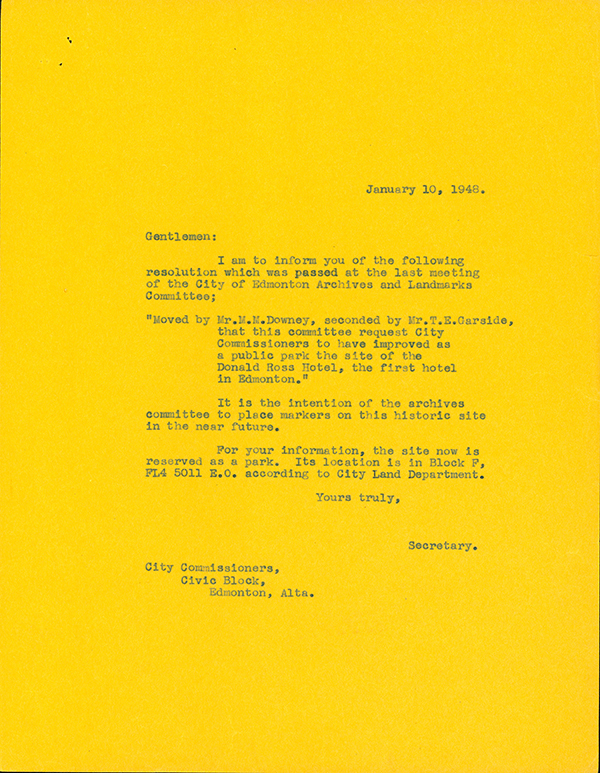 Letter from Council re: Donald Ross Hotel. The Donald Ross Hotel memorial unveiling in 1961.